Judging a book by its cover may be an old adage, but exciting artwork for the cover of a paper doll book is a must. An eye-catching cover promises glamour and fun cutting and dressing the dolls that grace the front and back covers of books published by Jenny Taliadoros’ Paper Studio Press. Coming up with a cover design is always a creative challenge and “Hollywood Gets Undressed” was typical. As always, first come the dolls, in this case four (3 female and one male). I did several versions and sent the ones I liked best to Jenny for her approval. Then I dreamed up a large figure of the blonde doll wearing the feather-sleeved beaded negligee worn by Jean Harlow in Dinner at Eight. Jenny then worked and reworked the typography and background several times. I wanted to try a more “dramatic” effect on the big figure, so I added lots of blue shading. Both Jenny and I liked the effect, but we also agreed that it was too overwhelming and took all the attention away from the blonde doll, also on the front cover. We decided to place the red-head doll’s head on the blonde doll body. A simple task, thanks to the computer’s Photoshop program. The back cover was a no-brainer with three dolls standing in front of a big tufted cushion and we are ready to move on to the eight pages of clothes. Too dramatic artwork leads to final cover for publication. Leading Men Coming in 2018! Male paper dolls are a bit rare. I have only a few in my vintage collection: Rock Hudson, Pat Boone, Clark Gable, Edd Byrnes, Ricky Nelson. Of course, many of Tom Tierney’s historic-themed books include men such as Presidents of the past. I’ve included a guy in a few of my recent books (Hollywood Gets Married and Hollywood Gets Undressed). Jenny encouraged me to create a book devoted to five leading men from Hollywood’s Golden Age, so that’s what I will soon be doing. Initially I’m planning to include hunky, handsome dolls of Gary Cooper, Clark Gable, Gene Kelly, Tyrone Power and Rock Hudson. Reference photos of Gary Cooper, Clark Gable and Gene Kelly. Reference photos of Tyrone Power and Rock Hudson. Vintage 1957 Rock Hudson cover, doll and clothes. Vintage 1959 Ricky Nelson cover, doll and clothes. Vintage 1959 Edd “Kookie” Byrnes cover, doll and clothes. The fashion industry works on a very rigid schedule, introducing new collections months before the clothes are delivered to stores. (In recent years, renegade companies like Zara work on a shorter timetable and are known as “fast fashion” since they quickly copy ideas from trend-setting runway shows.) To add to the complexity of the fashion calendar, many companies present pre-season collections shown and delivered between the major seasons: Pre-Fall and Pre-Spring. Recently, the 2018 Pre-Fall collections were presented and showed such diversity that they could be worn any time of the year. That’s not a bad idea because it gives customers the opportunity to feast their eyes on myriad creations and to express their own personal preferences in look, color, fabric and styling. Nothing really new and different, but plenty of trends on offer. Take your pick! Pre-Fall 2018 Fendi, Alexander McQueen and Marni. Pre-Fall 2018 Carolina Herrera, Coach 1941 and Missoni. Pre-Fall 2018 Tomas Maier, Alexander McQueen and 3.1 Philip Lim. The coloring book craze keeps expanding beyond the initial stress-reducing fantastical designs. How about Norman Rockwell’s sentimental All-American artwork, patriotic and heartfelt? Norman Rockwell Classics in The Saturday Evening Post contains 30 of Rockwell’s beloved cover illustrations rendered for coloring by Sara Jackson into meticulously black-and-white line drawings, ready to color. Of course, the colorist can be true to Rockwell, but it’s tempting to have a bit of fun and go technicolor or perhaps even psychedelic. 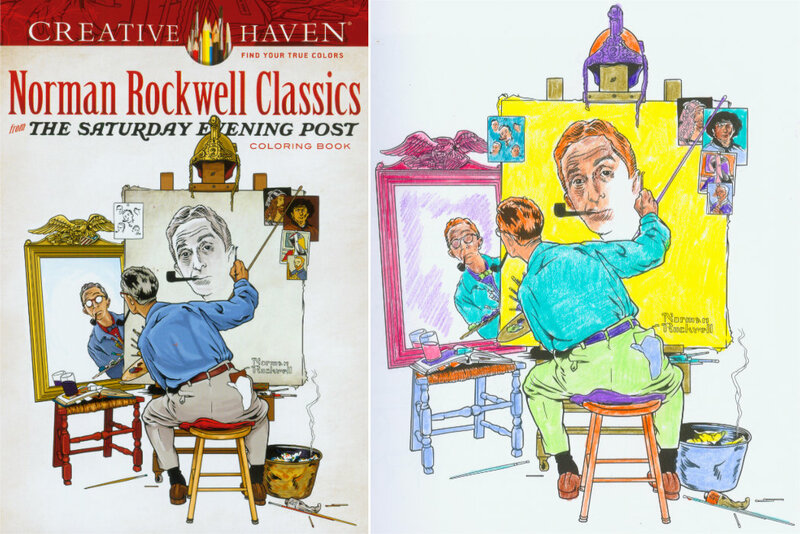 Norman Rockwell Coloring Book cover and my psychedelic coloring. 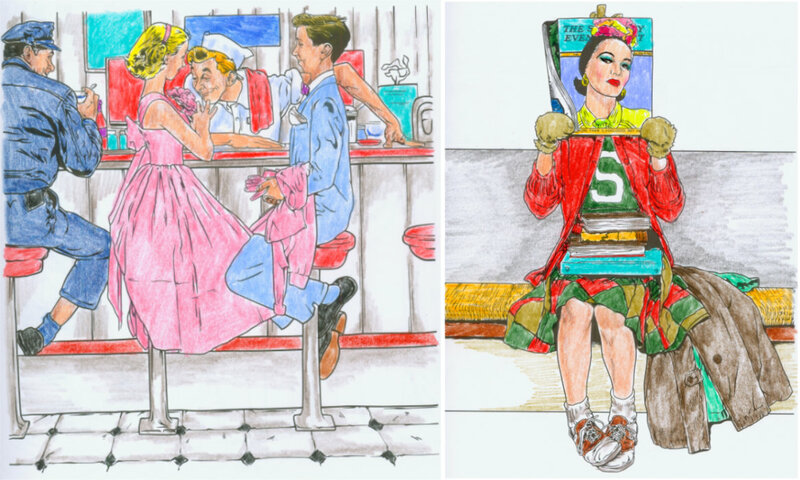 Norman Rockwell pages colored by David. Powerful Prints Pack a Punch! Digital printing, a major technical breakthrough in the early 1980s was followed by the development of dye-sublimation prints in the 1990s. With the new printing techniques, there began the most exciting prints in the history of fashion, works of art on fabric. 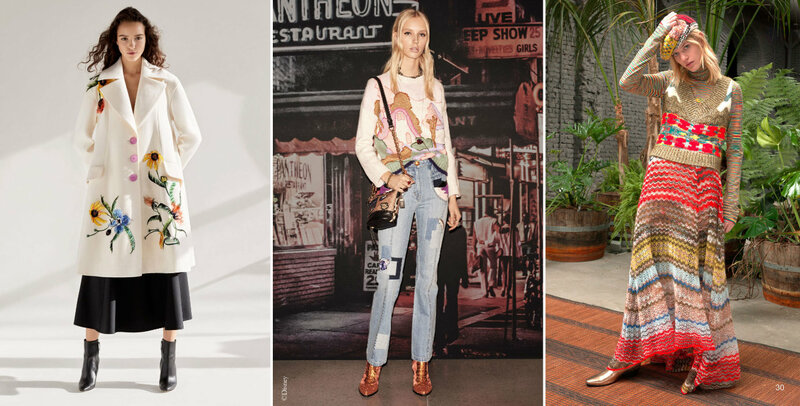 Spring ’18 designer collections continued to embrace powerful prints, mostly bombastic blossoms printed in glorious color, out-doing Mother Nature at her colorful best. Other motifs know no bounds and talented textile designers rise to the challenge, season after season. Spring ’18 promises to celebrate a plethora of artistic printed fabrics. Floral prints from Dolce & Gabbana, Dries Van Noten and Badgley Mischka. Fantastic prints from Comme des Garcons, Chloe and Emporio Armani. For paper doll enthusiasts, the pinnacle of each year is the paper doll convention, when we gather together for sales, exhibits, workshops, programs, banquet dinners, souvenirs, and fun time with friends, old and new. I hope you can join us! Download the form below or Click Here for a printable flyer. 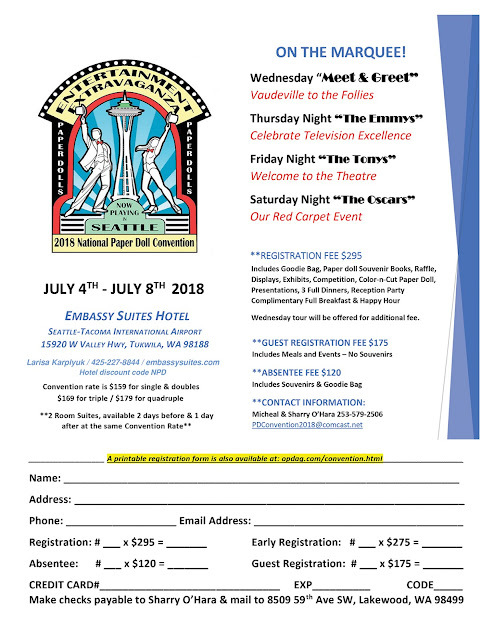 If you can't attend I urge you to order an absentee registration to get TEN spectacular souvenir paper doll books, created exclusively for the 2018 convention! With a theme like "Entertainment Extravaganza" you can imagine the dazzling array of subjects!